We are a unique hybrid of a toy, and teambuilding / training company. TOOBEEZ: A life-sized building kit with so many different uses and activities. EZ-Fort: A mid-sized building kit used by kids to build forts / hideaways. Think-EEZ: A building toy for use in teambuilding and or EZ-Fort building. Noggin BuilderZ: EZ-Toy for the classroom with structured activities. Jeliku: A toy, game and puzzle in one. All promote critical thinking, the creative thought process, and are super fun! Do you ship outside of the USA? Yes for TOOBEEZ. The other brands may be too costly. How many 57 piece kits will I need for my group? It depends on your learning intention and time allowed. As well as the number of participants. What are TOOBEEZ? 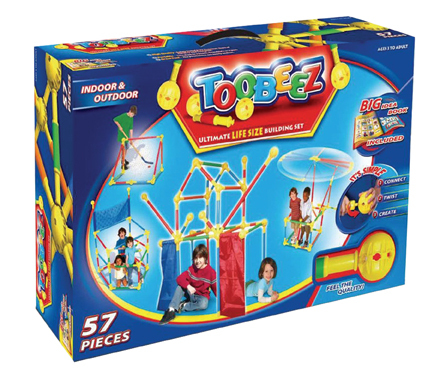 TOOBEEZ are a life-sized construction building system that can be used as a toy, an educational tool, a teambuilding prop or a therapeutic aid. Comprised of interlocking tubes and spheres, TOOBEEZ can be linked together to create anything imaginable, from a simple cube shape to a complex structure like an airplane or submarine. The name describes how the product works; tubes that are easy to use for work or play. How are TOOBEEZ educational? An open-ended product, TOOBEEZ challenge you to think about what you want to create, how you will create it, or how you will use them during an activity. TOOBEEZ were designed to improve problem-solving and reasoning skills as children use their imagination for pretend play. They can encourage creative thought, develop speech and language skills, help improve memory, introduce math and pre-reading concepts, help lengthen attention span and improve overall focus. Toobeez are a perfect fit for any child development program and were the 2005 winner of the prestigious Teacher’s Choice Award from Learning Magazine and Creative Child Magazine’s Preferred Choice Award. How are TOOBEEZ used for therapy? TOOBEEZ offer therapists a versatile treatment tool that promote social development, refine gross and fine motor skills, improve body and spatial awareness andstrengthensensory integration and sensory exploration. TOOBEEZ are typically used in occupational therapy, senior therapy and recreational therapy settings. How can TOOBEEZ be used as a teambuilding and training tool? - TOOBEEZ focus on teambuilding skills and engage teams in constructive and fun activities. The product offers teambuilding activities that promote communication, improve cooperation and build cohesiveness within teams. How much do TOOBEEZ cost?- The standard 57-piece TOOBEEZ kit costs $149.99. Each kit contains 32 tubes, 20 connector spheres and four slide-on curtains. Each kit also comes with a portable carrying bag. Additional accessories are also available for purchase, and activity workbooks retail for $29.99. Are TOOBEEZ safe? - TOOBEEZ are not a climb-on product, limiting injuries to children from falls or collapsing structures. TOOBEEZ have been designed and manufactured so that no part of the product or its packaging can present a safety or choking hazard to even the smallest child. The ends of the tubes will come apart if you attempt to climb on Toobeez. This is a special feature of the product specifically designed for safety purposes. Is the product guaranteed? - TOOBEEZ offers a 100% satisfaction guarantee. What is TOOBEEZ Project Connect?- TOOBEEZ Project Connect is a collaboration of industry experts and educators armed with the goal of helping associations, corporations, schools and other organizations further their growth and success. Project Connect has developed a collection of materials that provide activities, educational tools and lesson plans for use with TOOBEEZ. Products include activity workbooks and a multimedia training CD for educators, occupational and recreational therapists, trainers and teambuilding leaders. TOOBEEZ or not TOOBEEZ...that is the question! Background: With construction toys, it's all about the "connection" or the locking mechanism and size. To have a lock or not? That is an honest question. Lego's and Tinkertoy's are a near perfect products. With these toys..."you play with them". With our toys..."you play with them" and "inside them" as a big / functional product. The locking connection: TOOBEEZ has a patented locking mechanism that works within the tube & sphere. No extra locking clips required. EZ-Fort has a nice, snug, easy to assemble fit. Not too hard for the little hands! We urge you to look closely at the way EZ-Fort "connects". It is a patent pending "Friction and Tension" method of connecting. Question: Should a toy like this include a locking mechanism or not? Answer: It’s a fine line. To have one…adds more parts and cost. Therefore the price goes up. We elected to keep the price low. Question: Should it be easier to assemble for a 3 year old or a 10 year old? Answer: We elected to keep it easier. Here's why...This product was engineered in a very specific manner to address both of the concerns above. These products are NOT compatible / interchangeable. TOOBEEZ has 4 sizes (11,16,24,36") with the longest tube length at 36" and a 1 1/2" diameter. EZ-Fort' has 2 tube sizes (17 & 24") with the longest tube length at 24" and a 1/2" diameter. TOOBEEZ sphere is 3.4" diameter (smaller than a softball). EZ-Fort' sphere is 2.5" diameter (smaller than a tennis ball). Storage: TOOBEEZ has a bag and EZ-Fort uses its original box. Ages: 3+ Both products are not climb-on toys. Safety: Both products have passed all required tests mandated by law in USA, EU, AU, and NZ. Warranty: If you do not do any of the above, we will guarantee the product for 90 days. In closing, we thank you for purchasing our product and hope this answers your questions. EZ-Fort is a great building toy for under $50. It does an absolute fantastic job of being the basic framework for "fort and hideaway creation". This will someday replace cardboard box as the brand standard in fort building. This is our business...we know how to deliver "play value". TOOBEEZ (means...tubes + easy) will grow with the child and the family because it has many more uses. At $150. it's bigger, has more tubes sizes, which equals more possibilities. If you read this website and the product reviews...you'll better understand why. As you can see, the possibilities are nearly endless! PS...Putting a face on our company! We want to earn your business. We are a small American business that makes great products. We welcome you to join our family of satisfied customers. Please call me (or chat) with any questions at all.